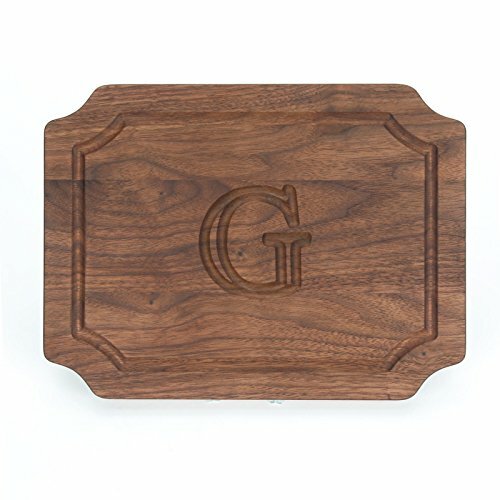 The BigWood Boards Small Monogrammed Cutting Board is a solid Walnut wood cutting board in a classic design. It is a versatile and personalized cutting board that is great not only for food preparation and serving but also great displayed as kitchen décor. Our small monogrammed board is 9-inches by 12-inches and 3/4-inch in thickness making it the perfect size and weight for a kitchen cutting board used for cutting and serving small portions. It makes an exceptional bar or cheese board for entertaining. The non-slip rubber feet ensure that the wood board stays secure and the perimeter juice groove catches liquid to keep the counter or table clean. These features add to the functionality of the board. This cutting board makes a lovely personalized gift for a wedding, birthday, or any other special occasion. 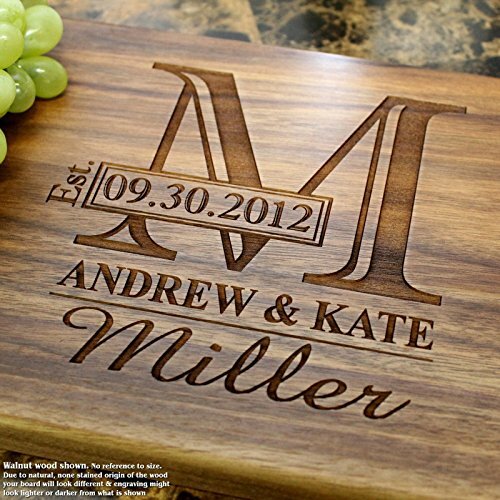 The beautiful carved monogram adds an element of personalization and makes this a special monogrammed wedding gift or monogrammed gift for another occasion.